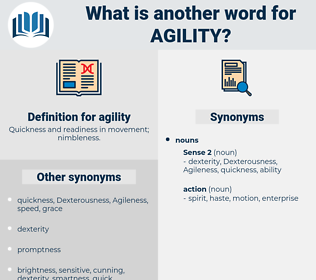 What is another word for agility? 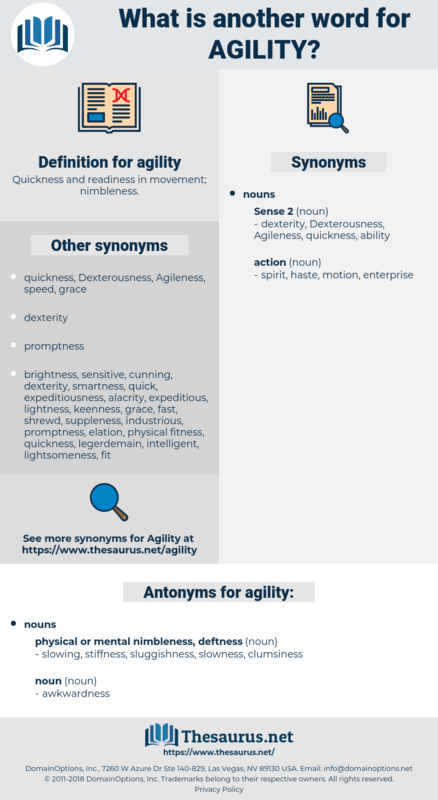 Quickness and readiness in movement; nimbleness. slowing, stiffness, sluggishness, slowness, clumsiness. Miss Millet sprang from her chair with the agility almost of a young woman, and ran to open the door, for a cab was heard pulling up in front of the cottage. Deerfoot knew that either was more powerful than he, but in cat - like agility there could be no comparison between them. aciculate, acyl halide, aglet, aiguilette, asilidae, asexuality, acold, assault, auklet, age-old, aculeated, auscultate, aculeate, aiglet, accolade, acolyte.